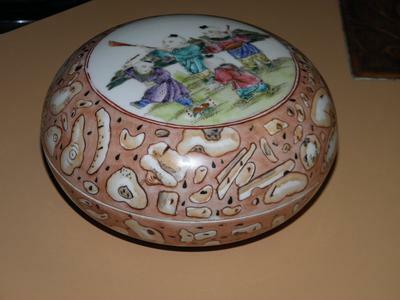 HI Peter, up for review is this circular box, it is 3-1/2" tall and 6-1/4 wide and it is a very fine porcelain, under a loop it is hand painted, I thought the mark was stampt but under the magnifier it is clearly hand painted, you can see the brush strokes, there is pitting and some rust spots, under the bright sun you can not see the pitting, so some of the pictures were taken in the natural light and then some inside so you can see the pitting, the ones I took inside came out just as good and out side, let me know if you need anything else and thank you for your expert opinion, I think this could be early republic, but I am not sure, thanks from Stan. P.S I will send you two more sets of photos. Hi Peter, thanks again for keeping me in check, I know the mark is spurious, and that the figures on the box are modern, I believe that they did not start making faces on the figures life like until around 1920 to 1950, I was hoping that this would fall in that age group, it was in the 50s that the porcelain paintings were untraditional, How ever I have never seen this reddish color that was used for the rocks in the design, I think they are rocks, I was told that the Chinese are buying porcelain items with figures from the 50s and they are paying good money, and you are right about Qing and Ming dynasties being scares, if this is from that period it would make it almost as old as me and I am an antique, so when do we consider porcelain to be antique, vintage has been called vintage now for 20 years, it will soon become antique right, but I will stick to the traditional porcelain, thanks again Peter. from Stan. You cannot look for age signs and ignore signs that an item is new (or recent/modern) at the same time. When evaluating an item, one single indicator that an item is new/recent/fake is sufficient to decide that it is the latter, and not vintage or antique. Most age signs can be faked nowadays. 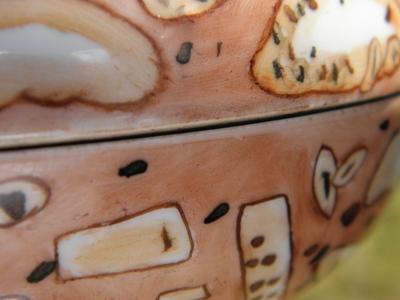 Most ancient kiln conditions can be reproduced. Only an overall checkup resulting in not a single negative sign allows us to assume an item is really old or antique. 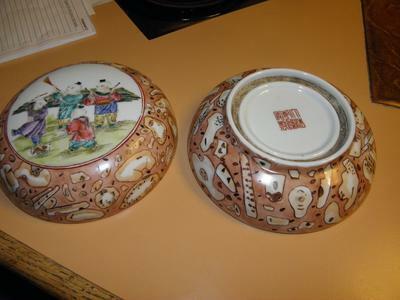 This double rim bottom is 20th century. 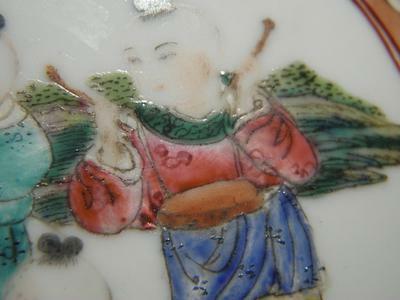 Such a rim shape virtually doesn't exist on antique porcelain, especially on small ones. The brown color in between is added for making it appear older. There is no reason that a recess would get that color in normal use. 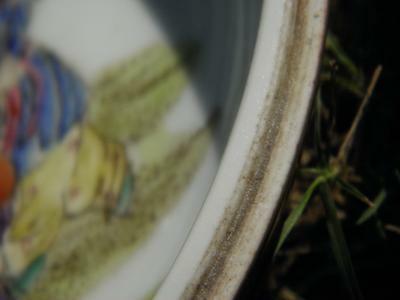 The pitting looks like the burst bubbles of 18th century porcelain, but even items from that time,with a larger diameter, don't have that many, usually. This is added on top of the glaze. 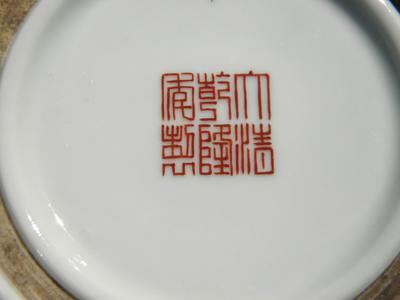 It imitates a Qianlong imperial mark, but marks weren't made that way in those times, much less imperial marks. The color combination looks typical 20th century to me. 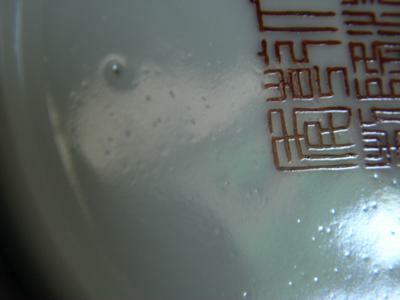 Decorations inside lids were rare and are actually mostly also a product of the 20th century. The outside brown decoration is nothing traditional at all. 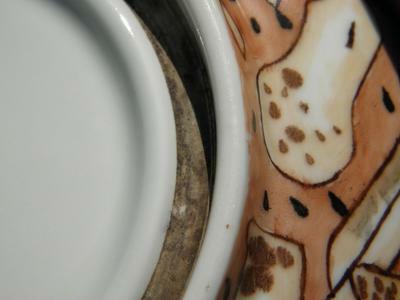 It looks more like something I would expect on modern western porcelain for use in the kitchen, etc. I wonder if this still fits the 20th century, or if it is even younger. I don't think this is meant to be a fake. It really is too obvious that it is modern. 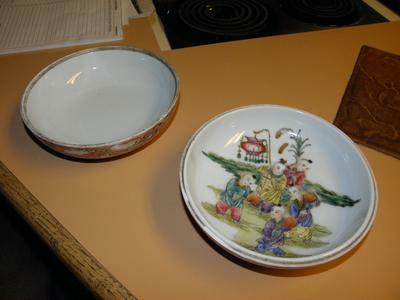 Please don't buy this type of ware. 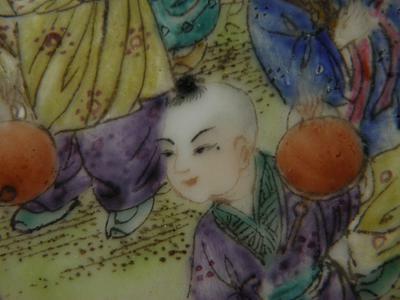 You must get accustomed to traditional designs if you collect antiques. 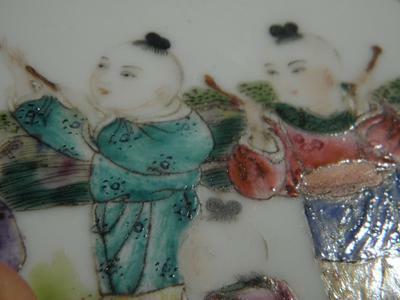 This can only be done by looking at lots of antique Chinese wares, or pictures thereof, I'm afraid. Hi Peter, I hope that these are good photos for your viewing, let me know if you need anything else, thanks, Stan. Hi Peter, here is another set and I will send on last set of photos, thanks again.